See Manchester Specs for capacities and dimensions. Used in a variety of applications — domestic, recreational, commercial, and industrial. 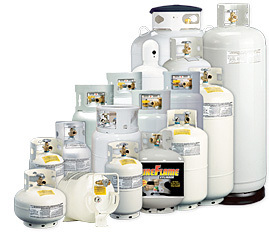 Fiberglass Propane Cylinders must be re-certified 5 years in Canada and have a lifespan of 15 years. We also sell 5lbs – 20 lbs recycled metal cylinders. No Fiberglass Recycled Cylinders. Cylinders have been sandblasted, repainted and are re-certified for 10 years. Recycled propane cylinders cost less and help the environment!